Sable bristled, set on a white plate. Four white china bowls arrayed nearby. Plus a big wooden bowl of hot salt with tongs stuck in it, and a fancy seltzer bottle. We were at Alinea, Sunday night, the world-renowned 3-Michelin star Chicago restaurant. If you read Wednesday's column, you know the chain of circumstance that led my family there. If I had to encapsulate the experience in one word, I'd say "surprise." That, or "mystery." Alinea is food as puzzle and delight. What is the shaving brush for? I assumed it would be put its usual purpose, to whip up a lather, some froth having to do with the clam chowder. 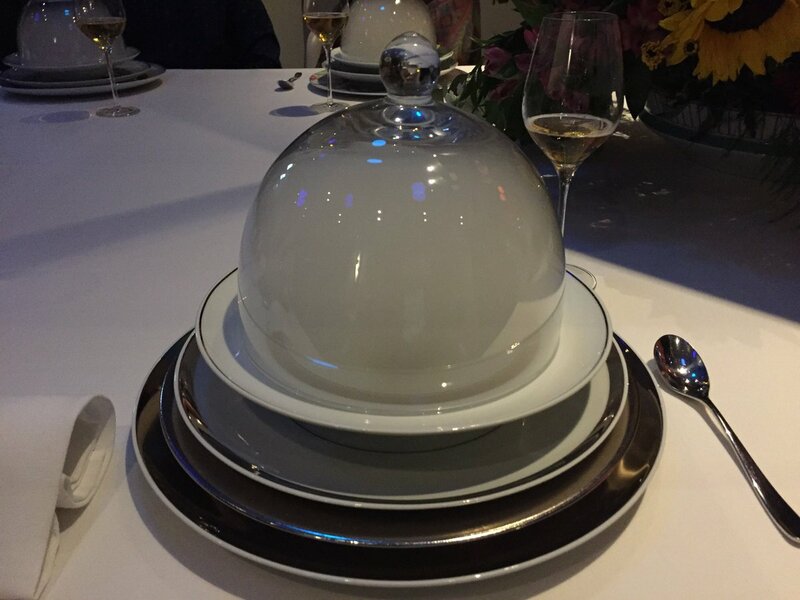 Molecular gastronomy restaurants—though Alinea prefers the term "progressive American"—are known for bursts of flavor, wafts of aroma, spoonfuls of tasty foam. We're getting ahead of ourselves. Let's start at the beginning. A black non-descript building on Halsted Street. No name; it's not like they're expecting walk-ins. The web site warns you that if you aren't there at the appointed time--ours was 5 p.m.—you'll cut into your own dining experience. At 4:50 we reported to the front desk 10 minutes early, as requested. 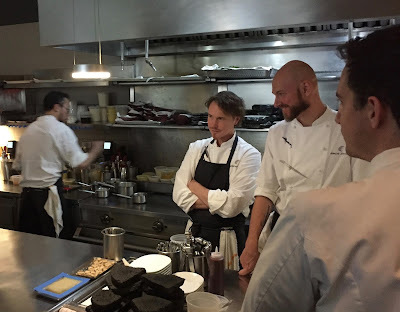 Grant Achatz, center, chef at Alinea. The surprise began at the greeting. No high formality, no brisk fawning of fancy French restaurants. 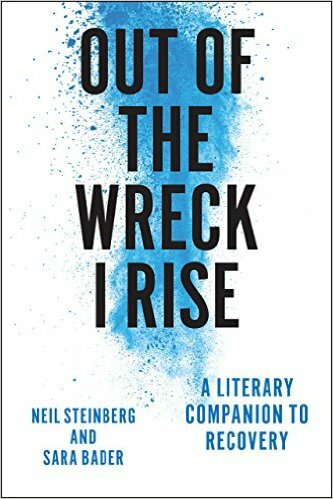 A cluster of young folks, then we were ushered into a large room and sat in the middle of an enormous table, my wife and younger son on one side, the older and I—both lefties—on the other, with five feet between us. The table sat 16, and was decorated with big bowls of flowers. There's no menu. You eat what you are given. They dangled a wine course before us, and then brought excellent sparkling cider. We toasted the boys and talked for a while—if I had to say the best thing about the staff at Alinea, they never cut off a conversation. They excelled at absence, part of what I began to realize is a conscience effort to keep the spotlight on the food. For some reason this has.me thinking of a line from the movie When Harry Met Sally. Carrie Ficsher repeating a line that the the carachter played by Bruno Kirby had written. Something about Dinner being the Theater of the 90's. Neil - I'm glad you enjoyed the dinner. It went much better than the one I had at Charlie Trotter's restaurant. The place and food and staff were so full of themselves that I had to stop off at a Burger King to get something to eat on the way home. No lie. It is sad what happened to him and I have to wonder if things were already going downhill for him when I ate there. So you sit at a communal table with 12 other people for the entire experience? At first. The transformation I refer to involves seating. My wife felt I shouldn't give it away. Why not just a “ spoiler alert... stop reading if you don’t want to know”. I think that not telling about something....something that 99 percent of your readers could never experience is kind of an unnecessary tease. Thanks for enjoying this on our behalf. Funny and informative at the same time. Your sons showed great wisdom choosing this graduation experience/gift over anything Disney. Even a great meal comes to an end after the contents make their way through your body. On the other hand, a visit to Disney World gives memories which last a lifetime. To each his own! I've been to Disney World a couple of times, and I mostly remember l lots of waiting in line and overpriced concessions and souvenirs. OTOH, I know people who go there annually or even more often, so clearly they're doing something right. Sounds like the Steinbergs will remember this evening for some time. From your description the experience seems worth the expense. While the Republic is in grave danger you should not feel guilty about the excess. Pardon the interruption but I can't get a different thought out of my head. I believe torture has no place in a country claiming to be christian and democratic. Our president disagrees, avowing that torture is productive. Now I am not saying that he should be tortured to give up the secret that connects him to Putin, I just think a waterboarding session for that purpose would involve about 2 cups of liquid to get him chatting like Rush Limbaugh about feminazis.